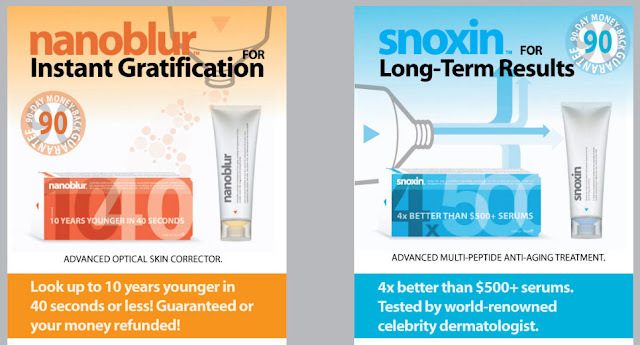 Your Beauty Industry: ‘Super serum’ Snoxin launches – but is it product results or media hype that drives sales of so-called ‘wonder products’? ‘Super serum’ Snoxin launches – but is it product results or media hype that drives sales of so-called ‘wonder products’? A new so-called ‘super serum’ called Snoxin hits the shelves of Boots today, claiming to ‘combat all aspects of skin ageing appearance, including the look of dynamic wrinkles, deeper folds, fine lines, crow's feet, textural irregularities and sagginess.’ Snoxin promises to ‘expect results within 7 days with continued improvement for up to 12 months’. Snoxin is produced by Indeed Labs, the makers of Nanoblur - a Skin Corrector which launched among much media hype last year with the very bold claim of ‘look 10 years younger in 40 seconds’ and resulted in sales of one Nanoblur being sold every 10 seconds. As regular readers of this blog will know, I am always very skeptical of bold product claims in beauty and I’m in favour of honest claims in return for consumer trust and loyalty. Remember that Channel 4 TV programme 10 Years Younger? Well the women on there did look 10 years younger at the end of each show – but not before undergoing a vast amount of invasive cosmetic surgery, a complete makeover and a whole new wardrobe. How a beauty product can claim to do the same in 40 seconds with just a swipe of cream is beyond me. I nearly fell off my chair when I read on Indeed Labs’ website that its objective was to ‘eliminate all marketing hype from skin treatments’. At least Snoxin doesn’t hold quite such bold claims as its predecessor, although I’m anticipating the same amount of hype. I find it fascinating when beauty brands hail new launches as 'wonder products' and go on sale with such instant frenzy - or in some cases, the hype starts before the product launches to create waiting lists for something that isn’t even available yet, thanks to some very clever marketing. The actual results of many 'Wonder Products' tend to be open to debate. Reviews of Nanoblur were mixed – many said it didn’t work (and when claims are so bold you are only building your consumers up to be more disappointed), while others said they loved it. When it first launched, I was sent a Nanoblur to try. I barely have any eye wrinkles so I thought, well if it’s going to work, it should definitely work on me because there are not that many wrinkles to fill in. It didn’t work at all. But what I found interesting was, when I gave Nanoblur to a 60-something relative to test and told her about the claims, she applied some to her nose to reduce her pores, looked closely into the mirror and declared that it had really worked. And while I couldn't see any real difference, it's fascinating that using a cream can make someone feel more confident about their appearance, whether it be based on well-marketed claims or actual results. What do you think about the media hype surrounding beauty 'wonder products'? Hi Ive heard a lot of comments about this product especially saying it isnt very good yet the nanoblur is better its all a bit confusing I think if they came down in price I would probably give them a go but at the minute all stick to my usual. hi, I started SNoxin on MOnday and have noticed a change over 4 days. Have not tried Nanoblur yet. I tried Snoxin for 2 months and I saw NO difference in my skin. I have gone back to Nivea products which are better for me. I saw an immediate improvement. I wish Snoxin did what it claims to do! By the way, I am a 63 year old male. This cream is a total con! I can not emphasise enough how much a waste of money it is. Tried both Nanoblor and Snoxin, and I'm sorry, their aint no change. AT ALL. I think it is up to all consumers to start telling of their own experiences as the cosmetic industry has no regulators, period! Nanoblur works pretty well for a few hours. It really does smooth out skin tone and does reduce the appearance of wrinkles. But it's the equivalent of putting on make-up (although it's not a pigment). I've done one half of my face with it and friends can absolutely see the difference. But it only lasts a few hours or until you wash.
After slating the 'claims' of both nanoblur and snoxin in your blog, did you actually try it yourself? It just seems you've based your opinion purely on those of others and 'stuck to your guns' with your skepticism over self proclaimed wonder products. Maybe you should test the product yourself first, and then form an opinion. Hi 'anonymous', if you had read my blog post properly, you wouldn't need to have asked this question as you would have found the answer in my post. However I will say it again for your benefit; yes I did indeed try the products, but I saw no results whatsoever. But like I also said, I am lucky enough to barely have any wrinkles, so rather than 'slate' the product without giving it a fair trial, I gave it to an older relative to try. You'll also see from my blog post that I don't actually 'slate' the products as you suggest, but I say that I am skeptical of such bold claims. After all, if the product actually did make people look 10 years younger, then the anti-ageing industry would take a massive hit as people shunned other anti-ageing products in favour of such a miracle product, and the cosmetic surgery industry would also take a massive hit as many people would no longer need to spend thousands of pounds on painful invasive surgery. Neither of which has happened. But if a product ever launches that meets these claims, I will happily champion it. I have not tried the nanoblur but I have been using snoxin for a week and half now and have noticed a change. My skin is smoother, my lines are smoother and my smile lines and marionette lines are less. I also use it on my neck and chest and have notice a huge improvement there. That is where my noticable wrinkles are and that is where I noticed the most significant improvement. I realize that something can work for one person and not another but for the price, I was sure willing to give it a try and am sure glad I did. I will continue to buy this product because it sure works for me. I've used both Nanoblur & Snoxin & actually wrote to Indeed labs I was in such a temper over Nanoblur. Its a faux product which clearly hasn't been tested & it must have been only men using it becuase it does NOT work with Makeup of any description. If you use it as instructed it is patchy, dry & congeals any makeup already on your skin so you have to start your make up again. To ensure I wasn't misusing it I used it on a clean face 'wtihout' makeup to see if there was any difference & if the makeup (many different kinds) was interfering with its performance. NO DIFFERENCE except my face was tight & uncomfortable. It felt rubbery & patchy. And with no benefits at all as to the camoflague effect its supposed to have on lines & wrinkles. I may as well have been rubbing on soapy water for all the benefit it had. And the response from Indeed labs was even more annoying. When I told them of my experience they put the problems down to the 'makeup'. They wanted to know what I used. I use many mainstream makeups from Loreal to Mac to Vichy. All standard makeup. And their answer was that they couldn't 'guarantee' that it would work with all makeups! What kind of a response is that when they clearly had to test it with makeup? And they clearly state 'makeup' on the instruction. They are 'non specific' on what makeup is recommended so one has to assume it is a compatible product with most mainstream makeup. They suggested I take it back to Boots. Which I felt was unfair as Boots offer the service of supplying many different products to the market. At no stage does the retailer guarantee results from all the products they sell! How could they. their job is to provide products, not guarantee the result the manufacturer makese claim to! I felt that this product is a nonsense product. Do not waste your money on it. Its horrible to use & one would have to put up with that if it was amazing in results. But its neither! I'm using Snoxin & to be honest, its nice to use but I see no major results & I'm using it now for 4 weeks. I don't look any different, I don't see improvement or any healthy skin improvements. Another nonsense product if you ask me. Not even a nice fragrance to either of them which might be some compensation for having bought it & not being able to get my money returned.